Yesterday we featured one of our upcoming wall mural images. Today's post highlights another new wall mural image we will soon be offering in addition to our custom wallpaper services. The image is a sunset that is obscured by gnarled twisted trees that are reaching into the sky. The coloring gives the image the feeling as though you were wearing rose tinted glasses. 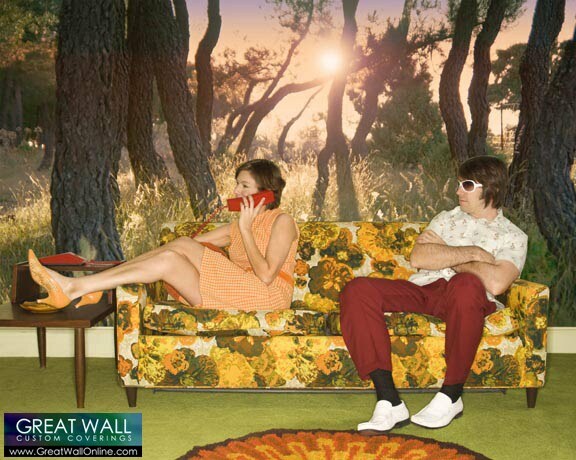 We love the nod that this mural gives to the more kitschy murals that were popular in the 70's. Nice photo and interesting post.. Very impressive! I always think it is absolutely amazing how one mural can change the entire atmosphere of a room. As a design and manufacture company we have done a lot of murals and each time I am blown away. Thank you for sharing. nice post.nice wall paper.I like it.